How can I wire a Lionel 6-12767 Steam Clean&Wheel Grind Shop to Transformer? Hello! I recently ran across a Steam Clean and Wheel Grind Shop without it's power source.I bought it anyway,but it sure looks like it would still work.Does anyone have any idea how I can 'hardwire' this to work with a transformer?? ?It even has the manual,which says the operating voltage is 12-14 volts.Is there anyplace I could buy the power supply? ?Either way it looks great and will be a great static display if I can't get it going.Any help greatly apprceiated!! Nothing feels as good as something you"ve done with almost nothing. Bringing a train back from the dead, is better than any NEW one money can buy. Be happy and RUN what you have, and share your Passion with the World!!! Be thankful,and good things will come your way. Put The Lord First, and the GOOD LIFE will fall into your hands. RUNNING O GAUGE ON A HO BUDGET!!! Any model train transformer should work, even a HO type with AC output for accessories. Any transformer with AC voltage outputs will do. That's basically all you need. NEVER try to power AC items with DC and ALWAYS run the white/red wires to the hot terminal output post, and the black wires to the ground output post. Most transformers with fixed voltage outputs have only one setting for output voltage which is enough usually. Others like Lionel's ZW allow to vary it quite easily. Hello,and thanks for your reply.Each module in the Steam Clean Shop is wired to a three prong plug.Where would I run the wires if I were to cut the plugs off?? Be careful. The controler is what gets 12-14 volts of power. The controller has anON/OFF rocker switch and three push buttons for the three actions. I'm quite sure no AC power goes to the modules. There are circuit boards in the controller. Kennyb, they're probably off on Sunday. 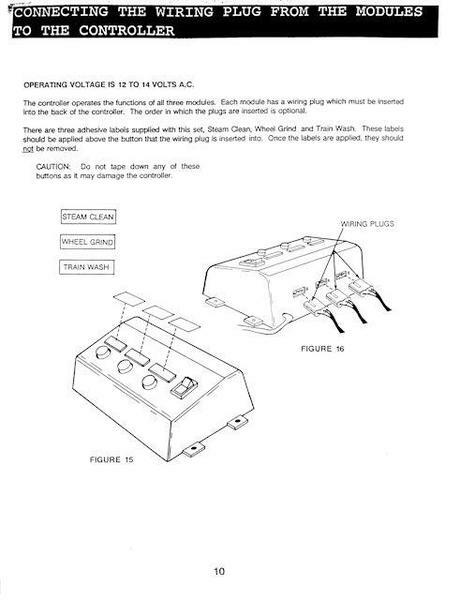 As seen in the manual posted on Lionel's website, the three plugs you see go into the controller. The power is fed into the controller per instructions in the manual. The controller is fairly basic so if you don't find one, you can make your own. Thanks for your reply.My question I guess boils down to:What do the three wires go to?Positive,Negative,Common,Ground???? Kennyb, when you go to Lionel's website and go to the manual you will see that those three please go into the controller. You feed the power to the controller. The controller is basic enough you can make your own if you can't find a controller. Let me add to this since I'm repairing a steam clean and wheel grind shop that someone ran without the controller, cut off the wires, and then promptly blew components on the smoking tank section of the accessory PCBs. THEY ARE DC ONLY!!!! Now yes, absolutely, you feed AC into the controller box, but the actual individual accessories are using DC and do not have rectifiers in them, they use DC polarized caps, DC can motors, and you will blow the transistors on the boards, likely blow the polarized caps if you connect AC to the 3pin plugs. If I find the person who did this to this accessory, I'm going to give them an earful and worse, the whole reason I even came here to the topic is hope of finding that specific plug that they cut off. Luckily, Lionel seems to have reused common components on these PCBs, so the small transistors were S8050 and the larger one was a TIP31- again, both common components used across many PCBs Lionel has built and I have been repairing lately. The mistake literally blew the S8050 in half- and luck was on my side the etched face with the part number was left intact. The wiring scheme is that the wires all have markings on the 3 wire ribbon cable. One is all ----, the center is ++++, and the last one is a wider spaced - - - -. - - - -= DC ground. Inside the control box with switches, it's nothing more than 4 diodes o make a bridge rectifier, a large 25V rated DC capacitor to filter the DC, 3 momentary switches to operate the action on each accessory. The white connector, the 2 pins are spaces close together, the 3rd pin has a gap between it and the other pins. Thus 1.414 x Vrms= Vp, meaning 12V RMS AC, rectified full wave to DC with a filter cap is roughly 17V DC, 14V AC RMS is 20V DC- which is why the capacitor is a 25V max, and should a user do something like connect to track power and shoot 18V AC RMS into this, that cap and the others like it will go bang. Yes, I'm neglecting the 0.7V drop across each diode, so minus 1.5V combined (both diodes) to he above, but for rough numbers, it appears that it's at least 16V DC to roughly 20V DC required for operation within specs. Also, parts reference but does not give the detail about wiring or voltage like I just gave.